Mansfield Town’s massive League Two showdown with neighbours Notts County on Saturday (1pm) will see the sides compete for the brand new Matt Salmon Trophy, named in memory of former physiotherapist Matt Salmon, who died aged 25 in May after a long battle with cancer. The trophy will then again be competed for in the reverse fixture at Meadow Lane in March of next year. Earlier in his career, Matt enjoyed work experience in the medical department at Notts County before three-and-a-half years at the Stags as academy physio up until his untimely death. Matt’s wife and family have been invited to the match as special guests to mark the occasion. Mansfield Town chief executive Carolyn Radford said: “Matt was an incredible person, the type to do anything for anyone. He brought so much to his role at Mansfield Town. He was completely indulged in his work and loved his role at the club. The Stags also announced that a new physio room, currently under construction at One Call Stadium, will be named in Matt’s honour. “We wanted to pay our respects to Matt by leaving a legacy for his family and wife. We wanted to do something where he was remembered for a long time,” said Mrs Radford. Notts County chairman Alan Hardy said: “This was the very least that we could do for Matt. “We were all devastated to learn of Matt’s passing, it was incredibly sad. I initially saw his tweet a couple of days before his passing and shared some tweets with him. I obviously knew he was poorly, but had no idea of the level of his condition. “He was at Meadow Lane for only a short while but his reputation lives on. He had a wonderful time with us and learnt a lot under Johnny Wilson and the rest of the medical staff and they still speak highly of him today. Matt’s father Andy, said his son would have been humbled to learn of the trophy. He said: “We are so very proud that this fixture has been named in Matt’s memory. “The response from his colleagues, friends and fans at Mansfield Town and Notts County and the entire football family immediately after his death provided us all with enormous support and for that we are very grateful. “Whilst Matt was at university he worked with Notts County’s youth teams, providing first aid and match day pitch side care. “After graduating he became the senior academy physiotherapist at Mansfield Town where he was responsible for the day-to-day care of all academy players based at Brooksby Melton College. “For both clubs to play for a trophy in his name would bring a wry smile to his face, although he would try and hide it behind his professionalism and focus on caring for the players. “For two months at the end of 2014 Matt was the acting head physio for Mansfield Town first team and we were very proud to watch him at his first game at the One Call Stadium against Cheltenham. 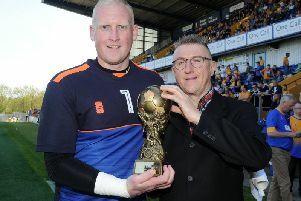 Mansfield Town manager Steve Evans added: “It is well and truly deserved that the trophy should be named after Matt. To be taken from your family and your loved ones, your life taken away at 25 years old, is really sad for anyone. “I think we all felt it back in the summer, but none would feel it more than his lovely young wife and his parents. “This is two great clubs that Matt has been involved with coming together and a trophy named in his honour. “They say God takes the good ones young and Matt Salmon was one of them. So it’s a fitting testament we should have a trophy named after him.